Have you ever seen the movie that Bill Murray stars in called “Groundhog Day?” In the movie Murray plays the part of a television weather man sent to cover a town’s unique Groundhog Day celebration. Waking up the next morning, Murray’s character discovers that it is Groundhog Day again and is forced to repeat the same day over and over again. After last weekend’s events I am thankful that I am not doomed to repeat them again. In fact, we had a nice turn of events at our house since then. Dogs have always played a big role in the lives of my kids and saying good bye to our dog Petey last weekend was tough. I think all of us have mistakenly called his name during the last few days, I know that our house feels different without him. It is not that I didn’t grow tired of the dog on occasion, there was more than one time that I used his name as a curse word, but he was a good dog. When our friends found out about Petey many asked if we were going to get another dog. I laughed, either inwardly or sometimes outwardly, at that question because that was determined a long time before Petey passed away. Each time one of the kids saw a cute dog or puppy on television or maybe at a friend’s house they would ask if we could get another dog. It was not that they didn’t like Petey, they adored him, they just love dogs. Each time they asked I would answer that we were only going to have one dog at a time. As a result of our informal agreement, it was only natural for the kids and Leigh Ann to start looking for dogs online last week. We considered rescue dogs, several different breeds of puppies, and then we found them; we found a litter of 14 Irish Setter puppies in Kansas. Leigh Ann grew up with Irish Setters so there was a special place in her heart for this breed. I knew those dogs as well and could understand why she loved them. That was it, the decision was made so now all we had to do was work out the details. Bailey was the one that found the breeder in Kansas and began to have a conversation with her. Bailey is a smart kid and really wanted one of these puppies so she did a good job of gathering the initial information we would need to start the purchase process. After talking to the breeder myself a couple of times we came to an agreement and I made the payment. Now all we had to do was get the puppy from Kansas to Michigan. This was the first litter of Irish Setter puppies for our Kansas breeder as well as the first puppy she had shipped out of state. We were both aware of how common this was but unless you have done it once yourself there are always doubts and questions. 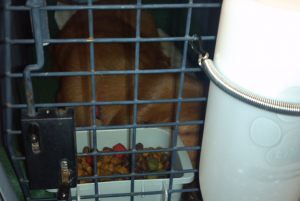 After one failed attempt, the breeder was able to get the puppy on the plane and headed toward its new home. Despite a strong desire to see this new puppy Bailey could not come to the airport with us because she had already planned an end of the summer swimming party; both Bailey and Leigh Ann needed to be at the party. I headed to the airport on Friday morning with Taylor, Lindyn, and Treyton – all smiling from ear to ear with excitement. At the airport we munched on some pizza as we waited for the screen to indicate that flight 5028 had arrived. Then it did. We picked up the puppy at the ticket counter and took him right out to the designated grassy animal area. He was a cute little thing and we could not wait to get him home so we did not waste any time. Once we were back the puppy wobbled around on his young little legs and explored his new home. Treyton and Beckett – the beginning of Trouble, Inc.
After some serious debate we arrived at Beckett for the name of our new puppy. Beckett was wobbly for the first day or so but then as continued to get stronger with each day. At first Treyton was not sure what to think. He tried to play with the puppy like he had Petey by holding a toy high and waiting for the dog to jump. When Beckett didn’t jump Treyton became bored and went off to play with some of his stuffed animals. The dog watched where Treyton went. When Treyton was minding his own business and playing with his stuffed Big Bird toy, Beckett pounced. The two wrestled; Treyton wasn’t sure if he should be upset about the attack on his yellow friend or if he liked the excitement. I think Treyton liked the excitement. Right now Treyton and Beckett are both a little unpredictable and seem to vacillate between being intrigued and a little scared by the other. Despite some reservations it is clear that the two boys will soon be friends. Treyton has taken it upon himself to make sure Beckett has what he needs. 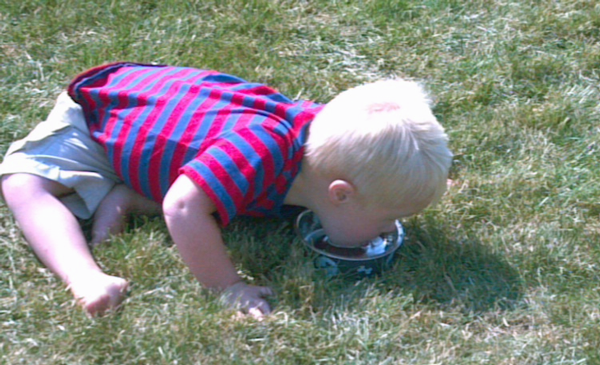 Treyton has gone as far as showing Beckett the proper way to drink from a water bowl. He is always nearby when the dog goes outside. 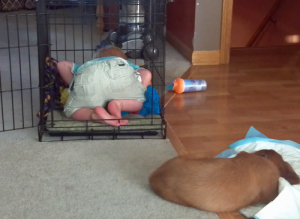 Treyton has also spent some time in the cage where Beckett sleeps at night. Aside from the typical enjoyment each family member gets from having a family dog, Leigh Ann and I have seen that it is especially good for Treyton to have a dog around the house. The dog acts as a companion when the house quiets down after the girls leave for school. 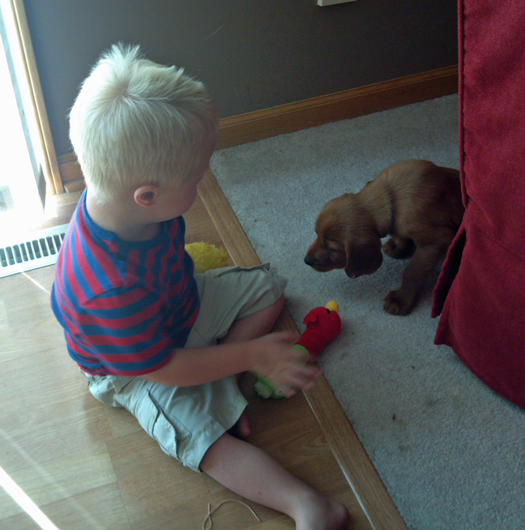 Treyton would play with Petey for long periods of time. It would not be unusual to here Petey’s bark followed by a deep giggle from Treyton as they played in the other room. It won’t be long before that is Treyton and Beckett creating havoc in the other room. We have seen Treyton use problem solving skills and as well reasoning skills when he interacts with his K9 friends. Pets provide a means for teaching appropriate behavior and responsibility. Having a dog provides and outlet for Treyton’s energy and the list of benefits could go on. If you could have spent just five minutes with Treyton and Petey you would understand what I am talking about. Dogs really can be a boy’s best friend. Maybe you have read through this post and wondered, “what’s the big deal?” Well, there are a few reasons for this post. First, I hope you see how “typical” Treyton is. 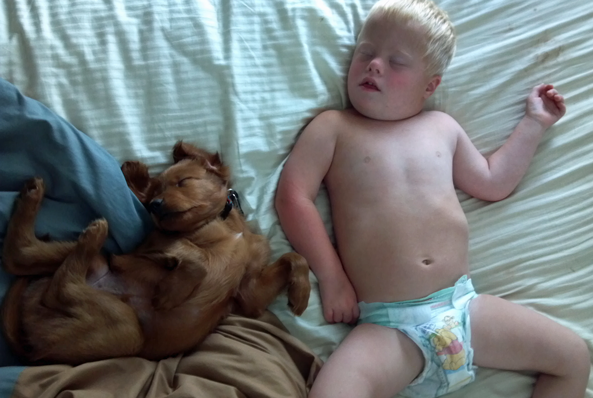 Yes, he has Down syndrome but his is all boy. Please remember that when you meet a person with Down syndrome, they are people that have a disability, the disability does not define them. Another reason for this post is to encourage parents that have kids with Down syndrome to actively find ways to keep their kids engaged in all aspects of life and to expect the same things from kids with Down syndrome as you would kids without the extra-chromosome. A third reason for this post would simply to give you a picture into our life at the Arnold house. Lastly, please keep in mind that the Step Up for Down Syndrome walk is coming up on October 13. We would love for you to join us at the walk but also please consider supporting us financially. All the of the money raised is tax deductable and goes to support the Down Syndrome Association of West Michigan.